Sleep MD Reviews - Does Sleep MD Work if You Can't Sleep? It is estimated that 40 million people in the U.S. suffer from sleep-related disorders, with insomnia being the most common. To fill the need for relief, several companies have begun to market products to help induce sleep and create a more restful sleeping experience. Among the biggest advertisers in this market is Sleep MD. 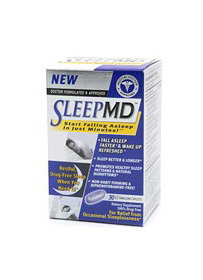 Sleep MD is the latest among Lovate's MD line of products that also include cholesterol and heartburn solutions. The makers of Sleep MD claim that their product will help you fall asleep quickly and they like to use a lot of jargon in their advertisements to show it is a scientific product, but they offer little explanation beyond the use of words such as “nanoparticulation technology,” which apparently is supposed to be a more sophisticated delivery system. This is supposed to reduce the ingredients to a size near a micron, but someone forgot to tell the Sleep MD people that micron is an obsolete term that has not been used in science for decades. Sleep MD can be commended for being primarily a natural remedy. However, their choice of ingredients is confusing to anyone who is familiar with herbal medicine. Extract of white willow is an aid for pain and fever akin to salicylic acid. Most health professionals would recommend that if you can't sleep due to pain, then a trip to the doctor's office is in order. In some cases, though, because it belongs to the NSAIDS, it can produce an uncomfortable sleep to a few people. Valerian root is included in Sleep MD, labeled as deodorized-grade. Valerian root can help to calm nerves, but studies can find no conclusive evidence that valerian is effective for insomnia. Lemon balm and hops extract may provide some taste, but little else. Lavender oils have shown to produce calming and sedative effects, but no studies have been done on the lavender powder contained in Sleep MD. Passionflower extract has been used for anxiety and relaxation but, so far, no studies exist to corroborate the claim. One of the biggest mysteries is the inclusion of Coenzyme Q10, which is used primarily to boost energy. The main ingredient of Sleep MD is melatonin and the only effective sleep aid among the ingredients of Sleep MD. Side effects of Sleep MD are minimal but there is some risk. Many people are sensitive to NSAIDS such as white willow extract. NSAIDS are known to produce a range of side effects including nausea, vomiting, irregularity, rash, dizziness, and fluid retention. NSAIDS also irritate the stomach, causing ulcers and bleeding. Valerian also has several negative qualities associated with it, including headaches, dry mouth, and morning drowsiness. Prolonged use has shown to have an opposite effect than intended, actually causing anxiety and insomnia. Liver damage has also been reported in rare cases. Sleep MD, with its collective ingredients is a risky proposition for many people who are sensitive to the side effects of medicines and herbs. For those who dare to risk the unnecessary ingredients and multiple side effects of Sleep MD, there is one plus. It is relatively inexpensive and easy to find. At one time, it was among the most popular of herbal sleep aids. Some of these websites still sell 30-count bottles of Sleep MD at the list price of $25.99 but more often than not it is now found at prices up to 70% off. Prices of $7.74 to $9.99 are common. If the customer reviews are any indication, these discounts are the result of overstocked dealers with no repeat customers. It is always questionable when such deep discounts are found across the board without any advertisements of a sale. For some people, Sleep MD works to satisfaction. In most of these cases, this is due to the melatonin content and nothing else. In many cases, Sleep MD provides a full-night rest but with the consequential side effects of morning drowsiness, headache, or worse. However, over half of responding users claim no effect at all. With so many questionable ingredients included in the formula for Sleep MD, it cannot be recommended.